How well you can smell could be a sign of overall brain health.A growing body of research suggests that the two are strongly linked, though researchers are just starting to figure out how and why. In a recent study, researchers found that a simple smell test may predict your chance of having dementia. In the study, researchers visited the homes of more than 2,900 adults ages 57 to 85 to test how well they could recognize five different odors: peppermint, fish, orange, rose, and leather. Five years later, researchers followed up with the older adults to find out if any of them had gotten a diagnosis of dementia since taking the smell test. Those who couldn’t identify at least four of the five odors on the test were twice as likely as others to have dementia 5 years later. 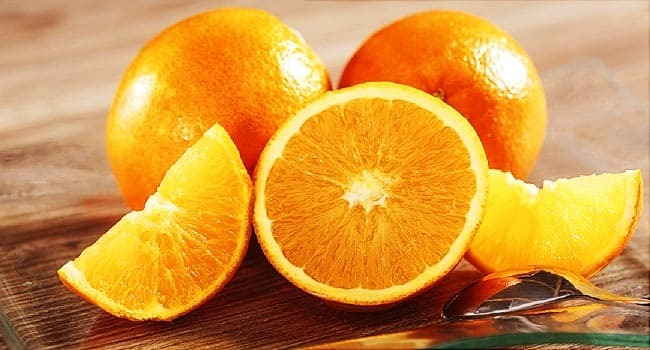 Oranges are one of the items researchers used to test brain health. The lower their score on the smell test, the greater their odds of having dementia. This decline in memory and thinking skills comes in several forms, including Alzheimer’s disease, Parkinson’s, and Lewy body dementia, among others. Pinto’s is not the only study to link a waning sense of smell — also known as olfactory function — with the breakdown of other parts of the brain. In fact, it happens with many conditions, known as neurodegenerative diseases, in which brain health declines over time. Obesity, which can raise you odds of having Alzheimer’s and Parkinson’s disease, might also dull the sense of smell. Studies show that exercise lowers the chance of losing this sense. But what is the connection between how well you detect and identify smells and your overall health? Doctors and scientists are trying to sniff out the answer to this crucial question. That’s especially risky since cells in the nose transmit directly to the brain. Neurons capture odors and send signals to the smell center at the base of the brain, known as the olfactory bulb. The signals then go to different areas throughout the brain, says Marie-Elyse Lafaille-Magnan, who researches the link between the sense of smell and the odds of Alzheimer’s at McGill University in Montreal. Some of the areas the olfactory bulb transmits signals to are related to thinking and memory. In fact, on autopsy, researchers have found brain tangles associated with Alzheimer’s disease, known as tau, in the olfactory bulbs of people who had Alzheimer’s, Parkinson’s, and other forms of dementia linked to smell loss. The nose’s direct line from the environment to the brain could mean that pollutants, viruses, and bacteria travel through the nasal passages to set the wheels of brain disease in motion. Some viruses, which researchers consider a possible cause of Parkinson’s disease, could reach the brain through the nose. Studies show that children and young adults who live in areas with heavy air pollution, such as Mexico City, have brain inflammation and buildup in their brains of some of the same proteins seen in older adults who have Alzheimer’s or Parkinson’s. These tiny particles that get into the brain through the nose may actually start the disease process, says Richard Doty, PhD, director of the Smell and Taste Center at the University of Pennsylvania Perelman School of Medicine. 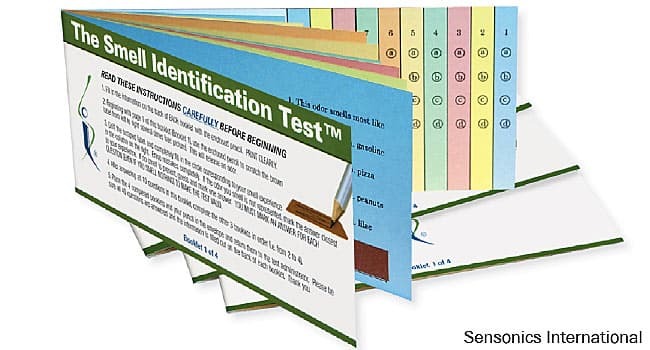 Sensonics International produced this 40-item smell test. It has already been shown that people who carry the APOE e4 gene mutation have a higher chance of getting Alzheimer’s. And notably, this study suggests that these people have an even higher chance of Alzheimer’s if they also live in a highly polluted area. Maybe it’s because the nose is so likely to be invaded by viruses and bacteria that olfactory cells can regenerate, even into old age, constantly repairing the sense of smell. “It’s possible that when that regenerative process peters out, when we get older, it’s a sign that [brain cells] can’t regenerate, and that reflects what’s going on centrally,” says Pinto.That petering out of both sense of smell and thinking skills associated with dementia might result from damage to a single part of the brain called the basal nucleus of Meynert. This damage could be due to harmful substances reaching the brain through the nose, or it could be an unrelated process. A nose that doesn’t work so well gives the brain less information. Some research suggests that this lack of stimulation may weaken other systems. Weight seems to play a role, too. Obesity is known to make brain disease more likely. People who are obese might have a weaker sense of smell than others. Researchers suggest that one possible explanation is that adipokines, chemicals given off by fat tissue, could weaken the sense of smell. Regular exercise, which improves blood flow and burns fat, helps the sense of smell in older adults, according to research. Although a smell test can tip doctors off that something serious might be going on, it’s not a tool for diagnosis. While the test does a very good job of identifying the type of smell loss that can lead to brain diseases, the results won’t suggest a person has one condition rather than another. But the results could prompt doctors to investigate more. There’s not yet a cure for Alzheimer’s, no matter how early it’s detected, but there’s value in knowing. First, finding people who are more likely to have dementia but don’t yet show symptoms could direct more people to clinical trials to find treatments to slow the progress towards Alzheimer’s. 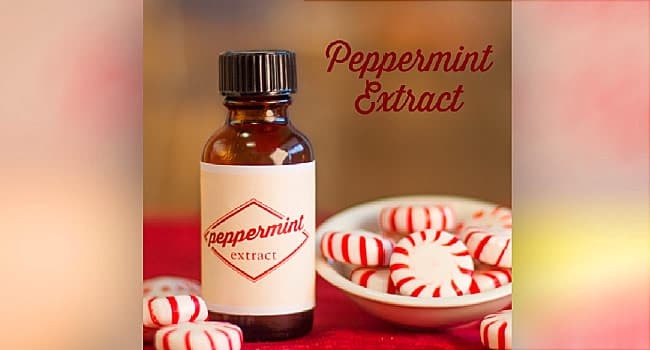 Scientists also said the ability to smell peppermint plays a role. “Maybe one reason these trials aren’t working is because we’re getting people in which the disease has already manifested, so it’s too late,” says Pinto. In the 5 to 10 years between the loss of smell and possible signs of dementia, lifestyle changes — such as exercise, more social interaction, and brain stimulation through puzzles — might make a difference, Pinto adds. Earlier detection can also help families and caregivers prepare. What’s more, while you might think you’re losing your sense of smell, you probably aren’t. “Self-perceived sense of smell doesn’t correlate well with objective sense of smell,” says Pinto.